Click the Browse button and locate the target files on your computer. Multiple files can be selected and added. 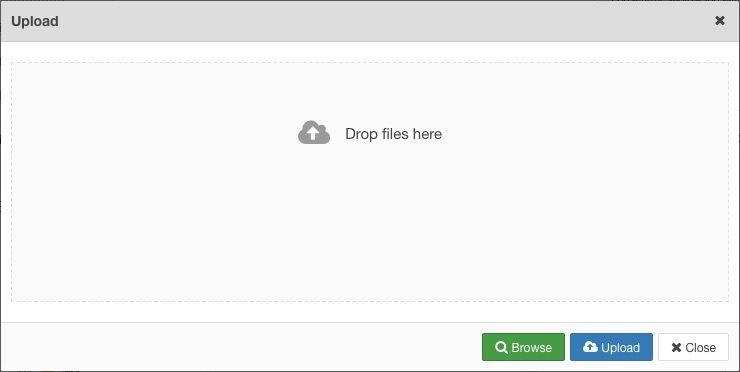 Files can also be dragged and dropped into the upload dialog. Click the Upload button to begin the upload. The progress of each upload will be disaplayed as a percentage and by the progress bar beneath each file. When all the files have been successfully uploaded, the dialog will close. If an upload fails, an error message will be displayed below the file name.